Step Mum of the bride badge in white with pink a red hearts and step mum of the bride written in a lovely black font inside a lovely red damask frame. These badges are perfect for your wedding and if your stepmother is forming part of the wedding party, you can grab her a special badge. 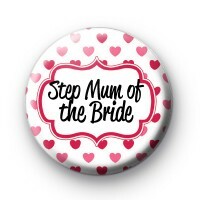 These step mum of the bride badges with pink hearts are designed to match our other hearts galore wedding badges, so you can get them for the bride, bridesmaids, groom, best man and other members of the wedding party. We have a massive range of hen party badges and wedding badges on the website so be sure to have a browse and grab all of the badges you need for your wedding day. Standard 25mm badge made by hand in our family workshop. We offer worldwide delivery & free delivery on larger orders. We also offer a next day delivery service which is available for your last minute wedding orders. So if you are in a hurry, we have you covered.